My very own Nostepinde! (gratitude #51) - Scientific Ink . Anyway, I broke out my lovely cherry with a streak of rosewood nosty tonight and created a lovely little football from my new Cascade garnet yarn. It’s surprisingly firm and even with my neophyte winding, the ball is unwinding smoothly as I knit. Go Nosty! It works great. Thanks Keith! Nostepinde winding instructions from Hatchtown Farm. Nostepinde winding instructions from Lisa Diak and Grafton Fibers. Wow, Dunrie…This is waaaaayyy too cool. I love to see that the piece functions as well as we hoped That is great. You did a wonderful job of winding. 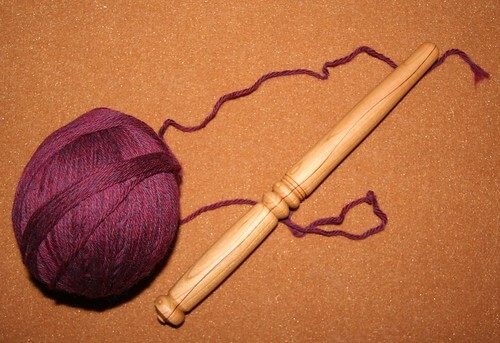 One thing to see a ball of yarn and a wooden wand, but to see them in action is quite beautiful. Thank you for this post!